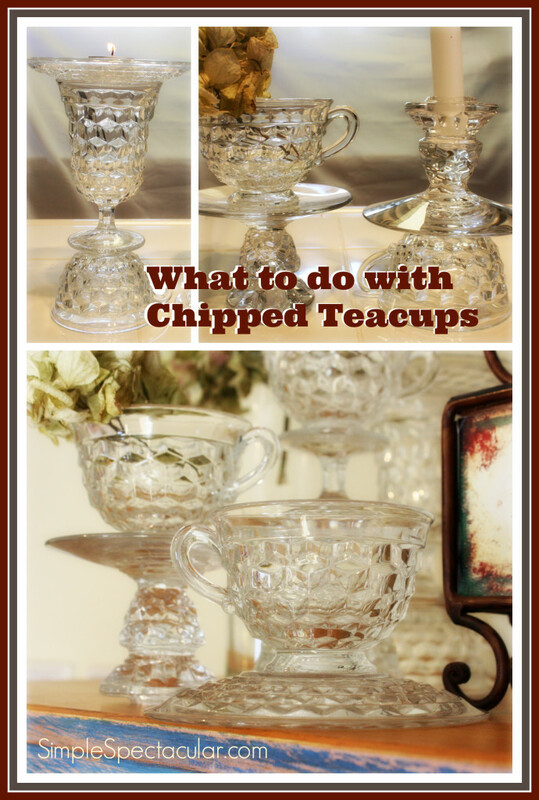 What to do with Chipped Teacups | Simple. Spectacular! I opened the box and began to take them out. My heart sank deeper each time I brought out another glass item with a chip in it. My grandma-in-law gave me her glass dinnerware set a few years ago. It had survived the three-and-a-half-hour trip across state lines only to have gotten jostled too much either during our 15-minute move across town or moving from shelf to shelf in our garage. 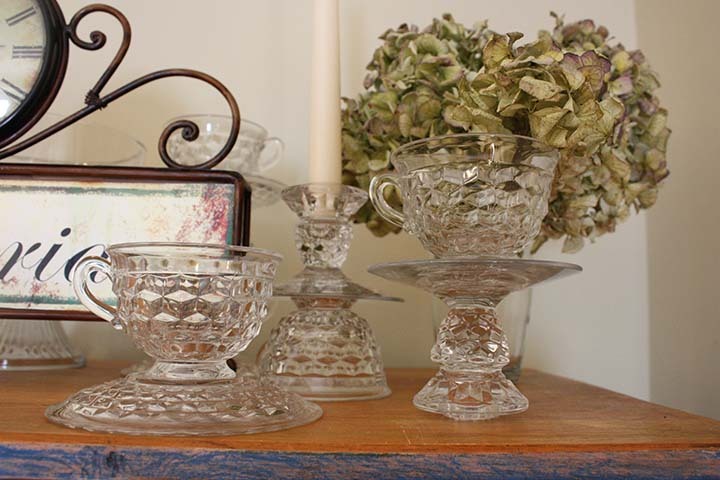 In any case, about half of the goblets, teacups and candle holders appeared to have a tiny chip on the edge. I couldn’t throw them away, but I also couldn’t use them to serve food. What to do with chipped teacups? Upcycle into DIY teacup candle holders, vases and serving dishes! I had been unpacking the dinnerware to find teacups to use for my daughter’s birthday party. So instead of using the cups for drinks, I decided a DIY teacup project intervention was needed. I’d use the cups as practical serve-ware and aesthetic centerpieces instead. I found, if I turned one cup upside down and covered the chipped bottom edge with a small saucer, the cup acted like a pedestal, creating a more dramatic serving plate. So, I gathered all of the broken items and stacked them in different patterns until the broken edges were covered and I was satisfied with the way it looked. Then, I broke out the Goop and started gluing. A day or two later, I had a new collection of serving plates, candle holders and cups. The new arrangements were clearly more unique and aesthetic than the original versions, and they turned out practical too! In fact, I get so much more use out of them now than when they were ordinary cups and plates! I’m proud to display Grandma’s pieces in a whole new way! Each piece can function two ways; the fun thing is… any side can be “up!” One way, it’s a butter dish. Flip it upside-down, and use it as a sugar bowl! 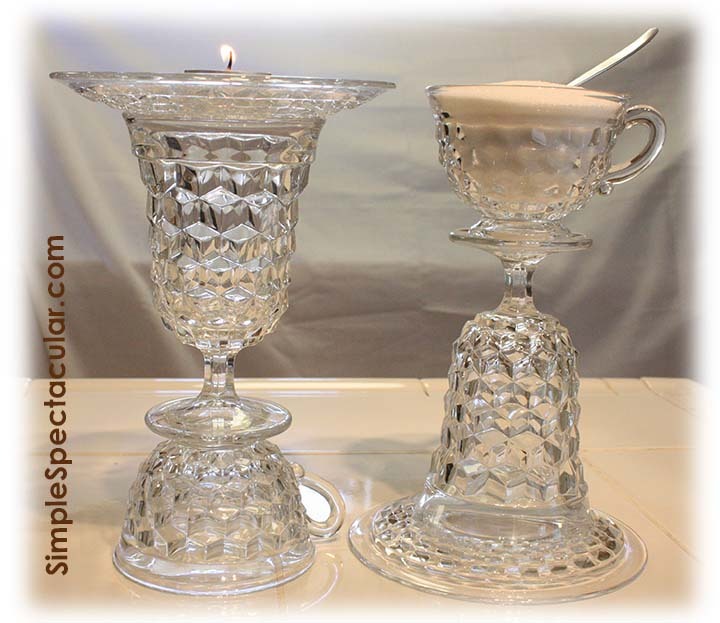 Another piece is a combination silverware holder and pillar candle stand. A third is either a flower bowl or a taper candle holder – depending on my mood and need of the moment! What to do with Chipped Teacups? 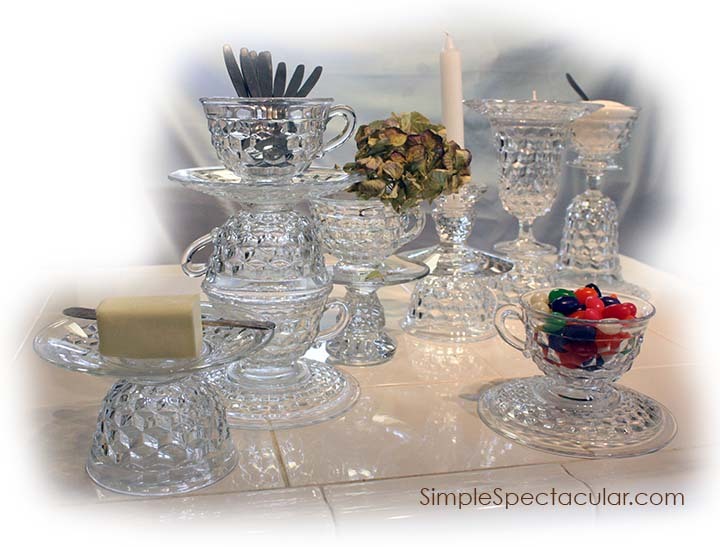 Gather small saucers and chipped candle holders and cups. Stack them two, three or four pieces high. You want to make sure all of the chipped edges are resting against another surface, so no sharp edges will be a safety problem once the project is finished. Also, check to make sure the stack is very stable – especially if you plan to use it with a lit candle. Lastly, make sure you like the look of the creation. Over a covered work surface, spread a thin layer of Goop, or your favorite adhesive, along the edge that will be glued to another piece. Set the second piece atop the edge with glue. Let this dry for 24 to 72 hours. If you’re adding a third piece, repeat step three after the first two pieces have finished drying. Continue with a fourth piece, and so on, until your “tower” is done! Enjoy your new piece! *Note that Goop should not be used on any surface in which food will be used. I only used it between the pieces, so the food would never come in contact with the “Gooped” surfaces. Share your ideas! How would you use your DIY teacup towers? I was have been broken hearted, but you redeemed them!!! Great job. Thank you Susan! I know, especially with something so sentimental, I’m glad they’re still being enjoyed! What a great idea! I just store chipped things I can’t fix because I can’t bear to toss them. Now I’ll have to revisit them and see what I can create. Thanks for the inspiration! I do the same thing, Cheryl! I’d love to see what creations you come up with! Have fun with it! These are adorable! 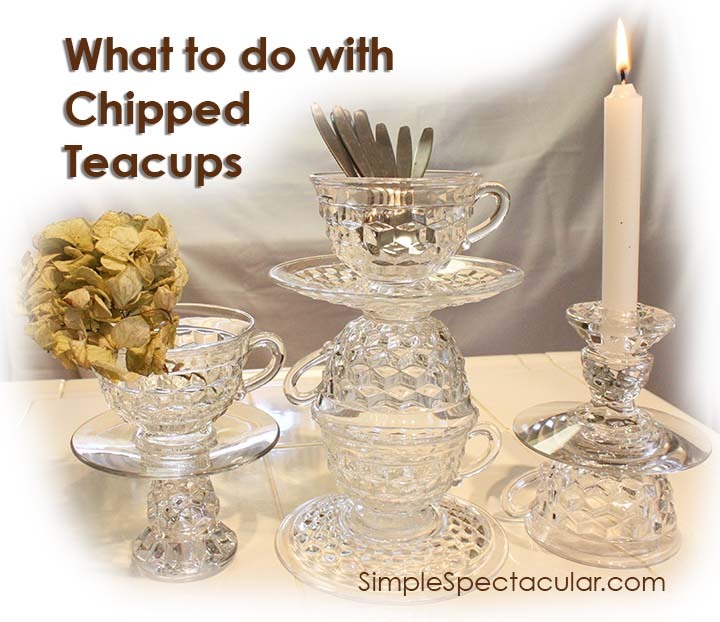 If have quite a few chipped cups that I just cant throw away-great project! Thanks, Sue! I’m like you too… it’s hard to throw away beautiful things – even when they’re a bit broken!